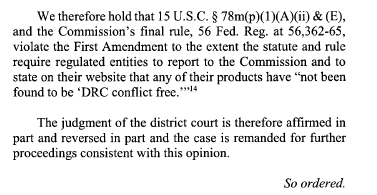 The United States Court of Appeals for the District of Columbia Circuit ruled that the SEC Conflict minerals rule violates first amendment rights to free speech. PMPA was an amicus party on the original filing. Violates petitioner’s first amendment rights. We will keep you apprised as new developments emerge. This entry was posted on Monday, April 14th, 2014 at 12:55 pm and is filed under Front Office. You can follow any responses to this entry through the RSS 2.0 feed. You can leave a response, or trackback from your own site. I’ll bet there are thousands of Machinist out there who were let go in the last recession and have found other work. Fair wages would get many of them back.